I am beyond disbelief that we’ve had three wonderful months with you sweet Evanna! During my pregnancy, I totally pictured a different scenario with spending the first few months of your life in the hospital and then a slow recovery at home. Certain things are still unknown, but you’ve surpassed our expectations and proved to be a tough little cookie! Clothing size: Now that you’re three months old, you finally fit 0-3 months very well (small just like her mommy). I did put you into one 3-6 month outfit, but it was a tad big on you. Feeding: You’re still on a good schedule which I’m sure you’ll stick to until you start solids in a few months. You eat about 110-150mL every feeding, and you eat at 7:30am, 11:30am, 3:30pm, 7:30pm and 11:30pm. You have no idea how much of an accomplishment this is for you. 22q babies tend to have severe feeing and GI issues, but thankfully you eat like a champ. You do get nasal regurgitation, but ENT will be checking into that this week just as a precaution. Milestones: You hold your head up very well and love talking to mommy and daddy about your troubles. You’ve discovered your hands and I find them often in your mouth. It’s hilarious when you hold your hands above your head just infatuated with them while I change your diaper – so cute! While on your activity mat you reach for all the little toys and you’ve even started to grab at them and hold on! We have also started to sit you in the bumbo chair once or twice a day which you love because while it’s working your neck muscles, you get to sit up, look around and interact with us. Tummy time is still an issue, but I’m going to make it a goal to work on that a lot this month. Loves: Your favourite thing in the world is walks around the house being held by your dad – even though he’s really just walking in circles. You like being held lots still, but sometimes you just want to lie on your mat stretching out. You like smiling and talking to your mom and dad, and the moment you catch our attention you lite up – it’s incredibly adorable. Adventures: Another busy month has past us by. We celebrated Canada ay at the beach, meet some new friends that also happen to be heart and 22q babies here in Calgary (we’re just starting our own support group lol!). We spent some quality time as a family for your dad’s 26th birthday by eating cake and going to a baseball game. Attended some more BBQ’s (it is summertime after all), and had our first bonfire of the season. We attended two different Stampede events and a very hot day at the Calgary Zoo. Last – but certainly not least, we went to Edmonton for a couple of days for your very first cardiac cath. Mommy and Daddy could not get through the month without: The swing, activity mat, omeprazole (reflux medication), your soother and tilted chair. I feel it’s about time to explain the technicalities of Evanna’s heart. She’ll be having open heart surgery very soon, and it’s only fair that I break down her diagnosis to help those who’ve been following along understand what exactly is being done. Now I am not a medical expert and will never claim to be (but I’m pretty sure I could now ace any Cardiology test in high school biology). Evanna’s diagnosis is very, very complicated. Most physicians (family, pediatrician, ER, etc) get a confused look in their eyes when I spell out her entire diagnosis because certain aspects are pretty rare. Only cardiologists and nurses who work either in the Cardiac Clinic or on unit 4 at the Stollery know what I’m talking about when we discuss Evanna and her very special heart. Let’s start with her diagnosis: Tetralogy of Fallot, with Pulmonary Atresia, VSD + MAPCAs. She also has 22q11 “DiGeorge Syndrome”, but I’ve already explained that here. I do plan on doing a Genetics update post in the near future, but at the moment I don’t have anything new in regards to her chromosomal defect. 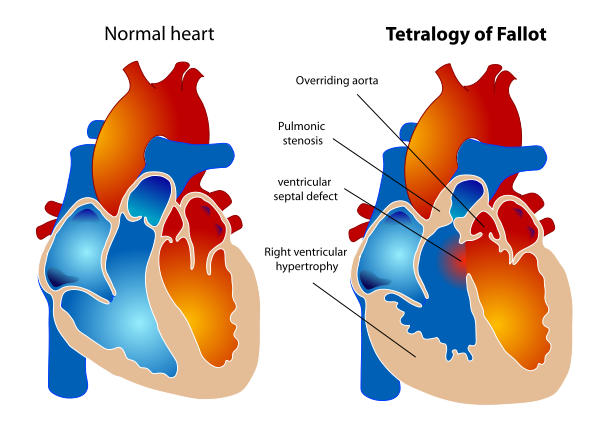 Tetralogy of Fallot: This part of her diagnosis is a bit more common in regards to heart defects, so generally anyone with a medical degree has heard of Tetralogy of Fallot. Tetra means “four” and it generally involves four abnormalities of the heart that commonly appear together. Overriding Aorta: The aorta is positioned directly over a VSD (the hole in her heart), instead of the left ventricle. This results in the aorta receiving some blood from the right ventricle, causing mixing of oxygenated and deoxygenated blood, and thereby reducing the amount of oxygen delivered to the tissues. Pulmonic Stenosis: This just means narrowing of the Pulmonary Artery. Evanna actually Pulmonary Atresia, which means she doesn’t have a pulmonary artery at all (which is considered the worst degree of TOF). I’ll talk more about this further down. VSD: Ventricular Septal Defect. This basically just means that Evanna has a hole between her two ventricles. This also causes mixing of oxygenated and deoxygenated blood, and thereby reducing the amount of oxygen delivered to the tissues. Many people are born with a VSD and it’s considered a very common CHD (congenital heart defect). Some will close up on their own within the first year, while others are so small that they don’t require any surgical intervention, and some require open heart surgery to close the VSD. This also is what allowed us to take Evanna home after she was born, because even though she has a severe heart defect, her body does receive a relatively good amount of oxygenated blood at the moment. You may hear me talk about her oxygen levels (at the moment she maintains levels in the mid-80s), and that just indicates how much oxygen her body is receiving. A normal person has oxygen levels of 96 – 100. Right Ventricular Hypertrophy: The right ventricle is more muscular than normal. Due to the misarrangement of the external ventricular septum, the right ventricular wall increases in size to deal with the increased obstruction to the right outflow tract. 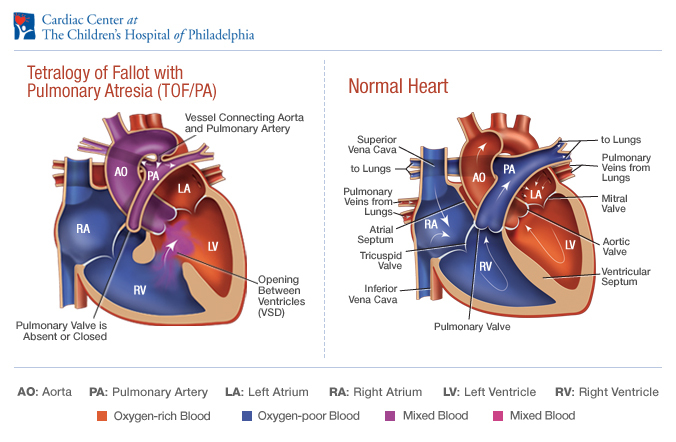 Pulmonary Atresia with a VSD: This is the very first diagnosis we were officially given, so I explained a little bit about it in this post here. But for the sake of this post, I’ll explain it again. I’ve already discussed what a VSD is (a hole in the bottom part of the heart). Pulmonary Atresia is when the pulmonary valve fails to develop. In a normal heart, the pulmonary artery is what brings the blood to the lungs to be oxygenated. A conduit (ie. a tube) will have to be inserted into Evanna’s heart in place of the pulmonary artery, but these have to be replaced every few years as her heart grows, and even when she’s an adult if the conduits begin to develop obstructions like clots, scarring or calcification. Many people ask how many surgeries Evanna will have to have, and this is the sole reason I can’t answer that question as she could have open heart surgeries all her life to replace conduits. 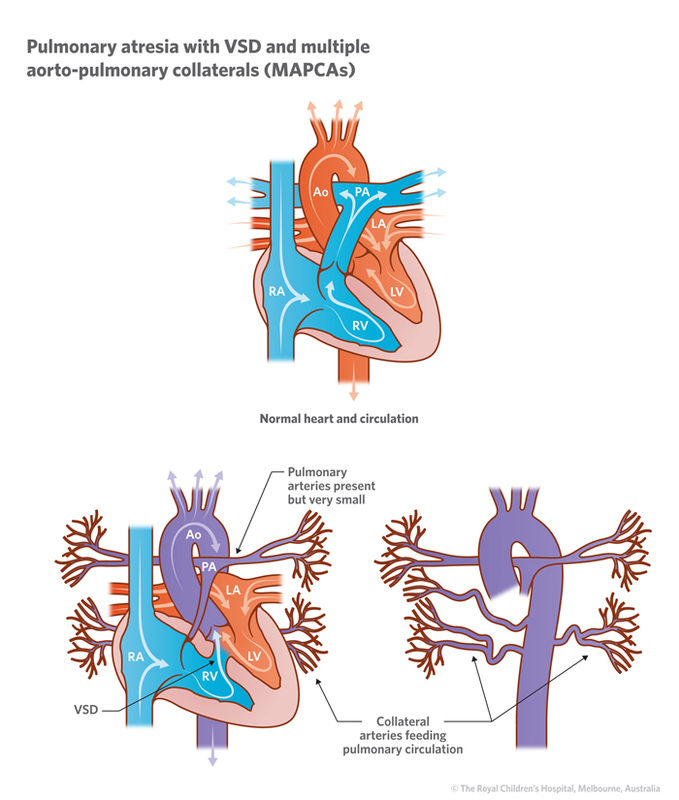 MAPCAs: Major Aortopulmonary Collateral Arteries. This is what makes Evanna’s heart extremely complicated, rare and special. If you hear me talk about her collaterals – this is what I am referring too. Because her heart did not develop a pulmonary artery and ductus arteriosus, her heart made its own little pathways to the lungs called MAPCAs (ie. collaterals). They are tortuous vessels that arise directly from the aorta or its branches. MAPCAs can vary in number and origin, follow circuitous routes to reach central, lobar, and segmental pulmonary arteries, and have variable areas and locations of stenosis (narrowing). Their pattern is unpredictable and often incomplete, leaving some lung segments with excessive or insufficient flow, and they can become narrow over time. As a result, a given segment of the lung may be supplied solely from the true pulmonary arteries, solely from the MAPCAs, or both. The morphology of the MAPCAs plays a critical role in determining management decisions. The aim of treatment for MAPCAs is to group them together and convert their supply to deoxygenated blood from the right side of the heart. Please note that this is the reason Evanna cannot have a heart transplant. The collaterals make her heart and lungs very intertwined, so the only way she could have a transplant is if they did a heart and lung transplant, which is unheard of for babies. I believe the youngest successful heart and lung transplant done here in Alberta was on a 4 year old girl. Basically Evanna has to make do with the heart she was given for the time being. Other: Evanna also has a right-sided aortic arch verses a left-sided arch. This basically just means that the aorta comes down the right side instead of the left. This isn’t really a big deal, but just something to take note of. Anyways this is the best way for me to describe her diagnosis in laymen terms, and it’s also how I understand her diagnosis. I plan on pretty much copying and pasting this post under our “heart journey” section of the blog for a quick reference, but it’s definitely a possibility that I may have to tweak the post in the near future, as we learn more and more about her special heart at every appt. She had her first cardiac cath just last week (which I will post about soon), and it was such a huge learning experience for the Nick and I. For example, we now know that we may be dealing with 5 collaterals instead of 3-4 (I think that’s a good thing). I’m so grateful that we live in a time of some amazing medical advancement that gives Evanna a chance of a normal life and we just have to continue to pray that her surgeons can successfully repair her heart. We are not out of the woods, and her cardiologist and surgeon will not give us any guarantees. She however is doing so well right now, and Dr. Fruitman is impressed with her progress so far, so that gives me hope. We have awesome friends and family who provide amazing support – so from the bottom of our hearts, and Evanna’s special heart – THANK YOU! 1. Evanna has discovered her hands. When she's awake and on her activity mat, her hands are full on in her mouth if her soother falls out | 2. Speaking of her activity mat - we've recently gotten into a little routine of eating, 5 minutes of tummy time (or as long as she will handle), 30 minutes of activity mat (again for as long as she will handle it), cuddles and hanging out and then nap until the next feeding | 3. Even though she's really hungry for the day's first feeding - Evanna is super happy in the morning. Her morning smiles are the best | 4. If she overtires herself and is fighting sleep - a tight swaddle has not let me down (so far...) | 5. Car rides have become a hit and miss these days. Sometimes she falls asleep right away, other times it takes 10 minutes of crying before she finally gives in. Nick turned 26 last week. His first birthday as a dad! I’ve thought long and hard about this post and I have taken a lot of time to decide what I wanted to write. For those who have been following our little “heart journey” may remember me mentioning 22q11 (“22 deletion 11”) or DiGeorge Syndrome at some point or another. It’s caused by the deletion of a small piece of chromosome 22 and the deletion occurs near the middle of the chromosome at a location designated q11.2. 1 out of every 2,000-4,000 children are born with it, but to be a little more detailed – 1 in 68 children with congenital heart defects, and 5 to 8 percent of children born with cleft palate will test positive for it. 22q11.2 deletion is almost as common as Down syndrome. 22q11 was something they brought up while I was pregnant and was told it was a possibility that Evanna would have it because of the particular type of heart defect she has. While pregnant they offered to have an amniocentesis to be done to see if she had it, but I denied as I didn’t want to harm her or myself just so I could satisfy the impatient part of me. It wasn’t going to change anything (abortion wasn’t an option we were thinking about), and in hindsight I am soo glad that we waited to find out, as it could have caused more stress to me when the results came back positive. Anyways last Thursday at her cardiology appointment, Dr. Fruitman was finally able to track down the results – and just like I suspected from the moment she was born, they were positive. You see, even though I was in denial while I was pregnant about her possibly having 22q11, I still did my research. One thing I read about 22q babies is they tend to be born with small mouth and ears, and I noticed it instantly with her when she was born. I get several comments on her “delicate” features, and that’s the reason for them. So what does this mean? Well it means several things. First it means that her heart defect wasn’t exactly random – however we DO believe the chromosomal defect is. From what we know, there’s only a 10% chance that Evanna got 22q11 from us, but we suspect that it was a mutation – not genetic. Nick and I will get tested ourselves as a precaution (and if one of us is positive, we will discuss our options for future kids – but privately as a couple). Evanna, however, has a 50% of passing it down to her children with chances of more severe complications (it gets worse as it’s passed down), but again, we’ll cross that bridge when we get there. I’m sure she’ll have many fertility options, and who knows what the medical industry will look like in 25 years. Baby steps. Evanna has other milestones and roadblocks to pass before we get there. What else? Well 22q11 is considered a “spectrum” disorder. This means that though there are MANY things associated with 22q11, every child is different, and we won’t know exactly what issues Evanna will have until they come. I have, and will continue to do lots of research to prepare ourselves, but we’re also going to try and just concentrate on what she does have and deal with each issue separately. We can hope and pray that her heart and thymus gland (and I guess the small ears and mouth) are the only issues she will have, but we also have to understand that we could be facing other things too. We have so much information being thrown our way, but we’re taking it all in stride. I’ve meet some other moms both local and online (Instagram) who’s children have 22q11 that have been super supportive and given me lots of advice thus far. So, what could we be facing? Well the list of issues associated with 22q11 is pretty long, but I’ll cover the more common ones, and how Evanna is doing so far. Heart Defects: This is probably the most common symptom of 22q11 and one of the red flags for it. Particularly Tetralogy of Fallot, Truncas Arteriosus, Interrupted Aortic Arch, and Ventricular Septal Defects (VSD). This is obviously a major issue that Evanna faces. Cleft Palates: Evanna doesn’t have one, but she does present with nasal regurgitation (her spit up comes up through her mouth and nose), so we may have ENT look into it just to be safe. Feeding and GI problems: So far Evanna has been swallowing and feeding great. They took out the NG tube after only 2 days while in the NICU, but that doesn’t mean she’s in the clear. Hopefully she will continue to eat well post open heart surgery. Immune Issues: This was another red flag for Evanna. They can’t see her Thymus gland by ultrasounds, but they did a blood test after she was born which shows she has an immune system. Hopefully that means there is some thymus tissue in there somewhere. Regardless we try to be careful with her, and keep our outings short. Growth, Cognitive, Development and Speech Delays (Learning Difficulties): We won’t know how this will effect Evanna quite yet, but it’s something we will watch very closely. They are pleased with her tone and her development thus far. I think this one will be a hard one for me, because I will have to learn not to compare Evanna to other babies her age. She will reach her milestones, but it’s very likely that it will take her longer (to roll over, sit up, crawl, walking and talking, etc). We will try our best to work with her and do everything in our power to minimize any delays and push her to do her best. We will probably be set up with Child Development Centre who will also help us and keep Evanna moving forward. Early intervention is the best! ** Don’t be annoyed if I announce on Facebook that Evanna finally said a sentence, or went potty, or started walking. Though these things are huge deals for you when they happened with your child, they will be an even a bigger deal because your child did not go through what Evanna will (heck any milestones can be difficult to meet for any child that experiences major surgery). Kidney Problems: Don’t have much to say about this one, but as far as know, Evanna’s kidneys are just fine. Hearing Loss: So far she seems to hear us and will move her head when she hears mine or Nick’s voice. However I’m sure she will be given a hearing test just to check and be sure. Her small ears do indicate a potential for hearing problems. Behavioral and Psychiatric Differences: Again, it’s hard to know if/what Evanna may experience (she’s only 2 months! ), but we still have to prepare ourselves for the possibility. Some examples that 22q11 kids have a higher risk of developing are ADHD, autism, anxiety, schizophrenia, depression, and bipolar disorder (the latter 3 developing more so in adulthood). Like I mentioned earlier, there are other issues that can present with 22q11/DiGeorge Syndrome, but the ones mentioned above are the most common and we will try and stay on top of as they may or may not come. I’m still researching and learning as much as I can (though sometimes I don’t like what I read) and will update the “heart journey” section when I can. I do not consider myself an expert and have only shared what I know right now (I’m still gathering information at this point and just sharing what I have learned). Nick and I love our little “doober” (one of the many nicknames Nick has bestowed upon our daughter) and we will do our best to make sure she has the best care possible (both medical and therapeutic). In the meantime we are just focusing on how well she currently is doing and smoother her with lots of love. To answer the question of how we are doing/coping (which people who we’ve told already have asked) with this diagnosis, I guess I can only say that we’re doing just fine. Both doctors and I had seriously suspected that she had it from the day she was born (so I’ve had time to adjust), and getting the genetic results last Thursday only confirmed our suspicions. I would have been more surprised if the results had come back negative. I’m sure there will be days that I may not cope as well, but right now we’re not focusing on it too much as there isn’t much we can do about it the moment. Right now, the only thing we’re focusing on is her heart and getting through her first of many open heart surgeries. We will be meeting with Genetics soon to go over interventions (physical, occupational and speech therapy) and getting myself and Nick and tested for 22q11. We have such amazing support from friends and family, and little Miss Evanna has so many people who love, care and root for her. I have been able to meet other heart moms who’s little ones have 22q11 (or heart moms in general) and they have been so awesome to turn to for questions and advice both here in Calgary and online (Facebook and Instagram). Thanks again for following along. I truly appreciate and enjoy each and every blog and Facebook comment I get. You guys are the best!